Owner Ged Rathbone hailed another ‘fantastic’ trophy win . . . then told his riders to forget about it. Panthers retained the SGB Championship Fours last Sunday to collect the first of six available pieces of silverware at this level – league title, Shield, KO Cup, pairs and individual riders’ championship are the others. But there were no exuberant celebrations following the triumph of Scott Nicholls, Ulrich Ostergaard, Michael Palm Toft and Bradley Wilson-Dean at Redcar. The victory is now in the past with the club’s focus very much being on tough tests that lie ahead in SGB Championship and KO Cup clashes in the near future. 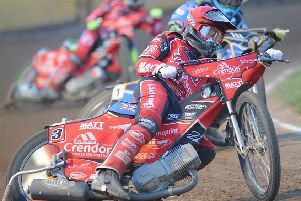 Rathbone said: “Winning the Fours was fantastic for ourselves, the riders and the fans. “It’s difficult to say whether the win last year or this year is better. I’d probably rate them equally. “One was at home with a couple of riders out in 2017 and the other was at an away track last Sunday so they’re both excellent achievements. “We’re in the history books again, but that’s gone now and we must look forward to the many meetings we still have ahead this season. “We’re sitting in a great position in the league to hit our target of reaching the play-offs, we’re in the semi-finals of one cup and the quarter-finals of another one. While the rest of the club’s management team, riders and supporters were a long way from home last Sunday, Rathbone was right on his doorstep. Many of them travelled for more than three hours and close to 200 miles to reach the Media Prima Arena, but Rathbone’s journey took barely five minutes from his front door in Middlesbrough. And he was delighted to lift the trophy in front of plenty of family and friends at a track he visits regularly. Rathbone added: “To win a trophy anywhere is really great, but to be able to show how good my team is in front of all my friends from my home town was special. “I’m still a regular at Redcar meetings with my family unless there’s a fixture clash with Panthers riding. “Now all the people there can see why travelling so many miles to and from Peterborough is so worthwhile - and it was brilliant to see so many of our supporters make the trip up to get behind the boys. “A lot of people seemed to put our win last year down to the fact we had home-track advantage even though we actually tracked a weakened team, but no-one can say that about Sunday.